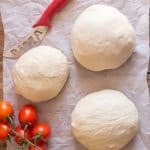 I haven’t made a recipe with the title written only in Italian since I first started this food blog, so why am I doing it now? Well because the translation to English is not the prettiest! Cat tongues, see what I mean? And why you ask would a cookie ever be called Cat Tongues/Lingue di Gatto? 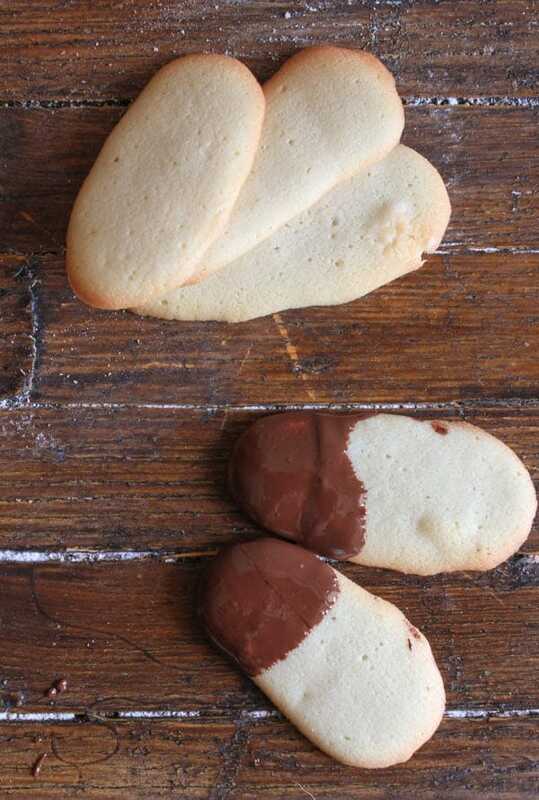 Because it has the shape and the top of the cookie has that rough surface just like a cat’s tongue. Oh but don’t let that fool you, they are super delicious, buttery, crunchy and yes I just ate four while I was writing this post. Every bakery I have been into they always have Lingue di Gatto and lots of them. 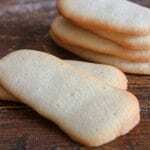 This is one of the simplest and easiest cookies to make. The perfect coffee/tea cookie, the perfect last-minute guests-are-coming-cookies to serve with a dish of ice cream. 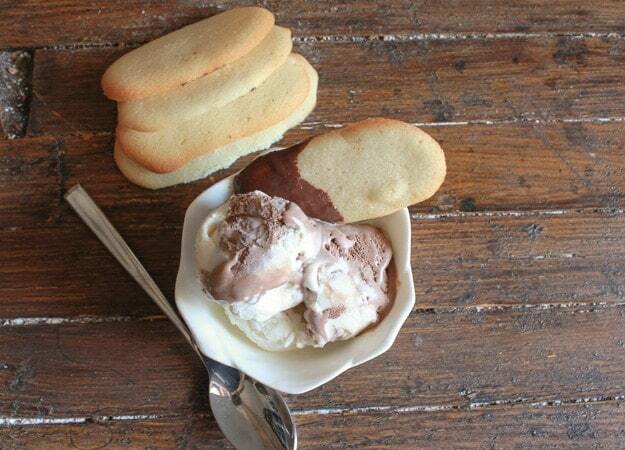 Lingue di Gatto are a five ingredient one bowl cookie recipe. Trust me I am the saddest person with a pastry bag and as you can see they came out fine! I prefer to line cookie sheets with parchment paper rather than lightly grease the sheets. Let them bake in a moderate oven for approximately 10 minutes, or until golden. Eat them as they are or if you feel like snazzing them up a bit, dip in melted chocolate. Enjoy! 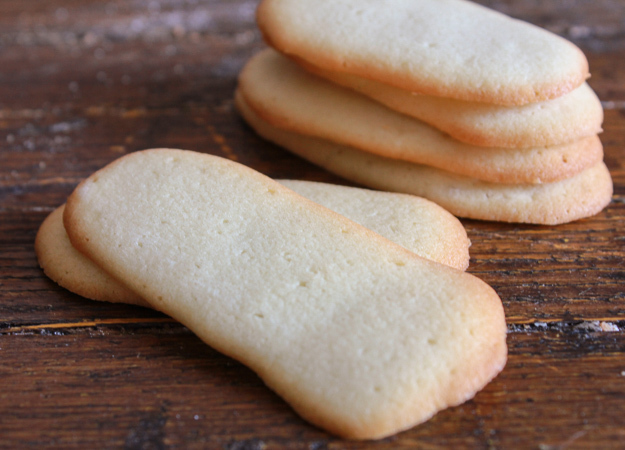 Lingue di Gatto or Cat's Tongue a delicious buttery crunchy Italian cookie, perfect with a dish of ice cream or a cup of coffee or tea. Pre-heat oven to 375° (190° celisus) Line 2 or 3 cookie sheets with parchment paper. 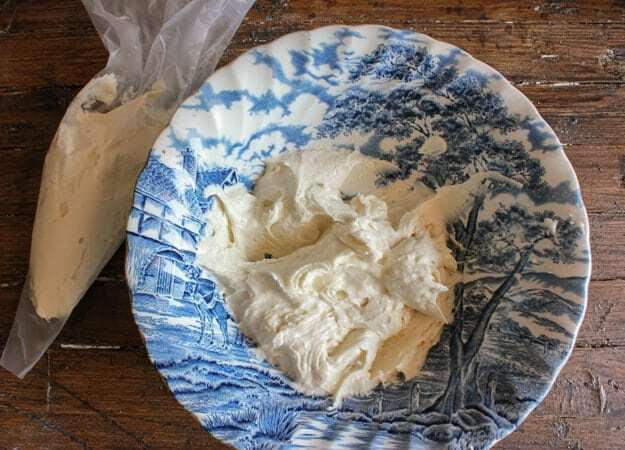 In a medium bowl beat butter, sugar and vanilla until creamy. 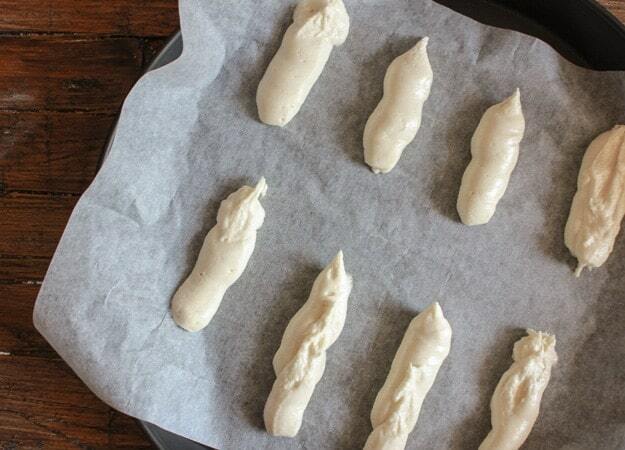 Gradually add flour and continue beating, add egg whites one at a time and beat until smooth and creamy. (should resemble cake frosting). 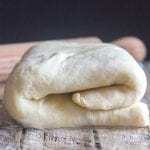 Fill a pastry bag (1/2 inch tip) and pipe out 3 inch (8 centimeter) long strips approximately 1 inch (2 1/2 centimeters) apart. Bake for approximately 10-12 minutes or until lightly golden. Let cool completely. Dip in melted chocolate if desired. Enjoy! 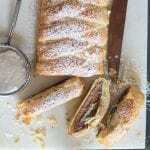 Thanks for this recipe of what we call in France : ‘langue de chat’. Just wondering, don’t you need to add some salt to the recipe? 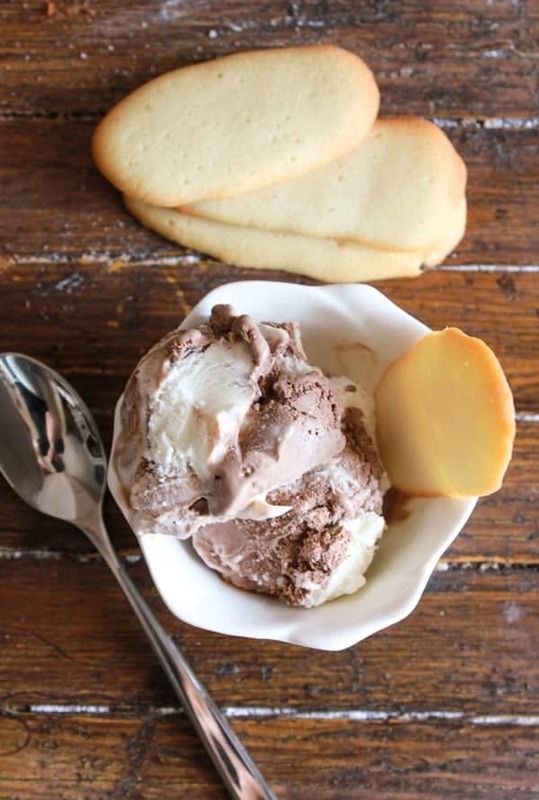 It is always a great hit at home with ‘mousse au chocolat’ or ‘salade de fruits’. Hi Emmanuelle, thanks, I received this recipe from a friend and I double checked but no it doesn’t call for salt. Does the French recipe call for salt? Lucky you Paris is beautiful! Hi Veronica, hope you had a fun sleepover, and enjoy the Frappe. Mmmm, I would like to be enjoying these with a cup of coffee right now! They look like homemade, tastier versions of MIlano cookies! Thanks for sharing with us at the #HomeMattersParty this week! Hope to see you again Friday! 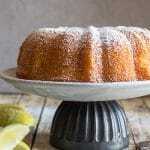 Thank you for another great recipe. I’ve never heard of this cookie but am definitely going to make it. Have a great weekend. Hi Ann, thanks Ann, let me know how you like them, have a great Sunday! Well, this is a cookie I’ve never tasted — looks like I have to make it. Italian recipes are not only delicious but have colorful titles. How about Brutti ma Buoni?– Ugly but Good. And there is Saltimbocca — jump in your mouth. Tiramisu etc. I think it’s a good idea that you keep the original title. Have a great weekend. Hi Marisa, thanks, yes this is a great little cookie, let me know how you like them. Have a great Sunday.